When I was in college, I had my first experience with sushi. The guy I was dating at the time took me to a nice sushi restaurant, and told me he'd take care of the ordering, since I was new to sushi and all. We had nice conversation, and I indulged in a big bowl of salty edamame. He directed me to put a little wasabi in my soy sauce dish, but after learning from a prank in high school that wasabi is actually nothing like guacamole, I politely declined. I'd been looking forward to trying sushi all day, so when it arrived, I could hardly refrain from eating the whole plate while the waiter explained what each row of sushi was. I grabbed my first piece, doused it in soy sauce, then I'm sure the color of my face changed from a sun-kissed California glow to a solid wasabi green. My date had ordered us a nice big pile of octopus. If you've never had it...it tastes and has the consistency of an eraser. Not surprisingly, I didn't try sushi again for a long time. Luckily, my now boyfriend insisted I retry it, and I've been hooked ever since. I'm still not a big fan of octopus though. In honor of my traumatic experience, I did some sushi nail art! Hahaha, what a great story! 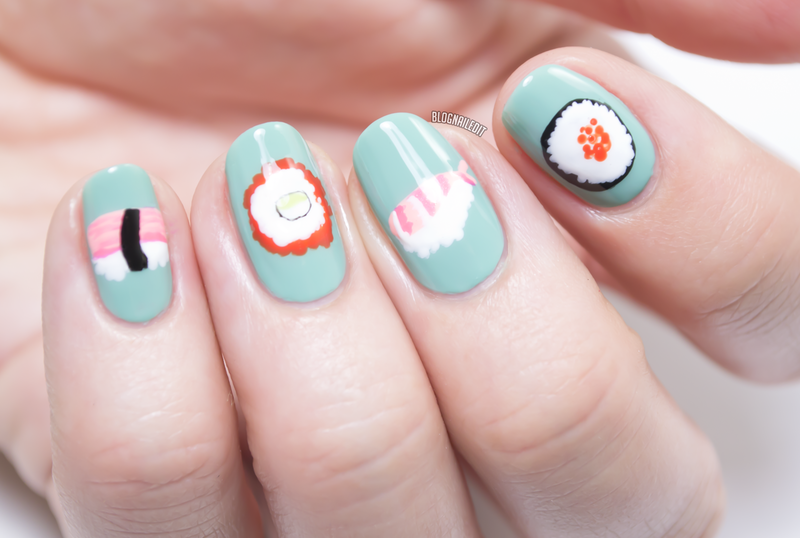 Such cute nails too!